The Valencian Community is an autonomous region in the west of Spain. It is the fourth most populous autonomous community after Andalusia, Catalonia and Madrid with more than 4.9 million inhabitants. Its homonymous capital Valencia is the third largest city and metropolitan area in Spain. It is located along the Mediterranean coast on the east side of the Iberian peninsula. It borders with Catalonia to the north, Aragon and Castilla–La Mancha to the west, and Murcia to the south. The Valencian Community consists of three provinces which are Castellón, Valencia and Alicante. According to its Statute of Autonomy, the Valencian people are a nationality. Their origins date back to the Aragonese reconquest of the Moorish Taifa of Valencia, which was taken by James I of Aragon in 1238 during the Reconquista. The newly founded Kingdom of Valencia was granted wide self-government under the Crown of Aragon. Valencia experienced its golden age in the 15th century, as it became the Crown's economic capital. Self-government continued after the unification of the Spanish Kingdom, but was eventually suspended in 1707 by Phillip V of Spain as a result of the Spanish War of Succession. Valencian nationalism resurged towards the end of the 19th century, which led to the modern conception of the Valencian Country. Self-government under the Generalitat Valenciana was finally reestablished in 1982 after Spanish transition to democracy. The most emblematic mountain of the Valencian Community is the Penyagolosa, in the Alcalatén area. It is widely thought to be the highest peak with 1,813 m, but actually the highest peak is the Calderón (1,839 m) located in the Rincón de Ademuz, a Valencian exclave between Aragon and Castilla–La Mancha. The most emblematic mountain in the southern part of the territory is the Aitana (1,558 m). The rather thin coastal strip is a very fertile plain mainly free of remarkable mountains except those around the Cap de la Nau area in northern Alicante province and the Peñíscola (Peníscola) area in the Castellón province. Typical of this coastal area are wetlands and marshlands such as L'Albufera close to Valencia, El Fondo in Elche (Elx) and Crevillent, La Marjal near Pego, Albufera of Gayanes in Gayanes or El Prat in Cabanes, also the former wetlands and salt evaporation ponds in the Santa Pola and Torrevieja area. All of them are key RAMSAR sites which make Valencia of high relevance for both migratory and resident seabirds and waterbirds. La Tomatina, is a festival that starts the week before the last Wednesday of August in the town of Buñol which is 38 km outside of Valencia. The week before people party and there is a famous paella cooking contest the night before the fight. On the last Wednesday of August the massive tomato fight begins with 20,000 to 50,000 tourist coming to participate in this epic battle in a town of only 9,000 people. The fight starts at around 10 o'clock in the morning, with the greasing of a long pole on which a ham is tight. After one person is able to release the ham, the mayhem can begin. Trucks with tomatoes will be hauled into the main square. Water canons firing water is the signal for the start of the fight. After the starting signal everybody's on their own for the next hour. It is mandatory to squeeze the tomato before throwing, as it otherwise would be to hard. After an hour, the water canons are fired again and the fight is over. Water trucks will clean the streets, but not the people! They have to be lucky to get hosed down by residents, or find a bathing spot at the river. 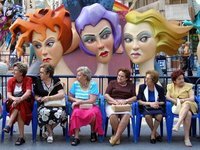 Falles is a city tradition that celebrates Saint Joseph's Day on the 19th of March, and the days leading up to that date. Each year every neighbourhood in the city of Valencia has a group of people that create a falla, which is then burnt. Only the best of one will survive. The entire city (and the rest of the comunidad) comes out for the festival in their Fallas dresses and it can get very crazy. Every day at 2 p.m. the Mascleta takes place of the Plaza del Ayuntamiento. This involves a lot of firecrackers and people from every neighbourhood trying to impress each other. As a visitor it is best to watch this from a safe distance. Mystery plays have been part of Europe’s religious history for centuries, mostly in the more northerly countries. The Elche Mystery Play is Spain’s oldest and most glorious cultural event, held every August at the town’s basilica. It’s a complex, powerful production involving modern stagecraft for its effects, and its final minutes see the Virgin and her angels raised to the heavens against a background of breathtaking choral music. The performance is the culmination of a week of partying, parades of Moors and Christians, candle-lit processionals and fireworks, and the legend of the libretto and music tells the story of it being washed up on a nearby beach in the 13th century along with an image of the Virgin Mary. Mediterranean to continental Mediterranean climate (Köppen Csa) and highland climate (Köppen H). These are the innermost lands and those at a higher elevation (cities included here are, amongst others, Alcoy, Morella, Requena and Villena). Here winters are cool to cold, especially at night (a few days of snow are not unusual), summers mild to hot and rainfall more evenly distributed through the year. The lower registered temperatures in the Valencian Community were in these inland areas during the cold wave of 1956. Temperatures plunged to nearly -20 °C; as in Vistabella del Maestrat (-19 °C) and Castellfort (-17 °C). Semi-arid climate (Köppen BSh), although in zones at the interior the average temperatures are slightly lower, being BSh in the Köppen climate classification. It roughly goes along the coastal plain from Villajoyosa through the southernmost border of the territory (cities included here are, amongst others, Alicante, Elche, Orihuela and Torrevieja). Summers are hot and dry, winters are cool to mild and its most prominent feature is a very scarce precipitation, typically below 300 mm. per year which is most likely to happen during spring and autumn. The reason for this lack of precipitation is the marked rain shadow effect caused by hills to the west of the Alicante province (and, to a lesser degree, those in the northern part of the province which, in turn, enhance the inverse orographic lift effect around Cap de la Nau). Valencia Airport (VLC) is the 8th busiest airport in Spain. The airport has flights to about 15 European countries with about 6 million passengers a year. Air Nostrum has flights to a number of Spanish cities, including Madrid, Bilbao, Seville and Málaga, and others include Casablanca, Dubrovnik, Madeira and Lisbon. Ryanair flies to/from Bari, Bologna, Brussels, Cagliari, Dublin, East Midlands, Frankfurt, London, Madrid, Milan, Pisa, Rome and Weeze (near Düsseldorf). Other airlines have flights to places like Amsterdam, Paris, Geneva, New York, Prague, Zürich, Bucharest and Stuttgart. Valencia airport is situated adjacent to the Autovía A-3 highway which connects Valencia with Madrid and is also close to the Autovía A-7 coastal route to Barcelona. It is also well served by public transport. The airport is connected to the city by a regular bus, which takes 45 minutes, a shuttle service, which takes 20 minutes, and the metro (lines 3 and 5), which takes 15 minutes. The metro also goes to the railway station and port of Valencia. Taxis and car rental agencies are both readily available at the airport and there are thousands of long-term and short-term parking places. Alicante Airport is even bigger than the airport in Valencia, making this a good alternative if you are going to visit the region. Many lowcost airlines fly to/from Alicante with Ryanair having flights to/from Aarhus, Basel, Billund, Birmingham, Bologna, Bournemouth, Bratislava, Bremen, Bristol, Brussels South-Charleroi, Derry, Sheffield, Dublin, Durham Tees Valley, East Midlands, Edinburgh, Fez, Gdańsk, Glasgow-Prestwick, Gothenburg, Frankfurt-Hahn, Haugesund, Karlsruhe, Knock, Leeds, Lille, Liverpool, London-Gatwick, London-Stansted, Lübeck, Maastricht/Aachen, Marrakech, Memmingen, Milan-Orio al Serio, Oslo, Palma de Mallorca, Paris-Beauvais, Pisa, Santander, Santiago de Compostela, Shannon, Stockholm-Skavsta, Airport Weeze (near Düsseldorf), Wroclaw, Zaragoza. Easjet has quite a few flights as well, and there are many more budget airlines and some regular airlines that have flights, mainly to countries in the west and north of Europe and some domestic flights. Subus and Alsa provide excess to the airport by bus. The first one to/from Alicante and Elche, the latter one to/from Benidorm and Murcia. RENFE is Spain's national railway company and there are highspeed trains travelling to and from Madrid and Barcelona, among other cities. Eurolines has buses to other destinations in Spain, Morocco and many European countries/cities. Algerie Ferries operates services between the Algerian city of Oran and Alicante. Trasmediterranea has regular ferries from Alicante to Ghazaouet. Acciona Trasmediterránea has ferries from Valencia to the Balearic Islands, like Mallorca and Ibiza. Balearia and Iscomar offers roughly the same connections as well. The first official language is Valencian (Catalan), which aside from a few minor differences is essentially the same language as Catalan spoken in neighbouring Catalonia. Valencians prefer to refer to their own version of the language as Valencian (Spanish: Valenciano), not Catalan. While nationalist sentiments in Valencia are not as strong as in Catalonia, locals are proud of their language and appreciate any attempts by outsiders to speak it. Valencian is not spoken universally throughout the region, however. Roughly 10% of the population speaks only Spanish, primarily in the western mountainous regions of Castellón and Valencia provinces. As with other parts of Spain, Spanish is co-official with the local language. English is spoken by staff at major hotels and the main tourist attractions, but otherwise, it is not widely spoken. This is version 18. Last edited at 10:48 on Mar 6, 19 by Utrecht. 21 articles link to this page.